You might think, “I’m just a small business with an even smaller marketing budget, why do I need a marketing strategy?” As a result of thinking you don’t need a strategy, you carry out marketing activities as and when you have time to do them or whenever you remember that you should be doing them. You spend time, effort and sometimes money carrying out your marketing without really knowing what you are hoping to get out of it or if it is working. Whether you’re a one-man band or a global corporation, this sounds like ineffective business planning to me. Having a marketing strategy in place, no matter what the size of your budget is or how many people you have on your team, has a number of benefits to the way you run your business and sell your products or services. A marketing strategy helps to give you, your team and your business a sense of direction. Without one, it might not be clear what you are trying to achieve, what needs to be done to achieve it, and whether or not it is working. By defining goals and the strategies involved in achieving them, it will provide you with a better focus, so everyone knows what they are aiming towards and what they need to do to achieve it. 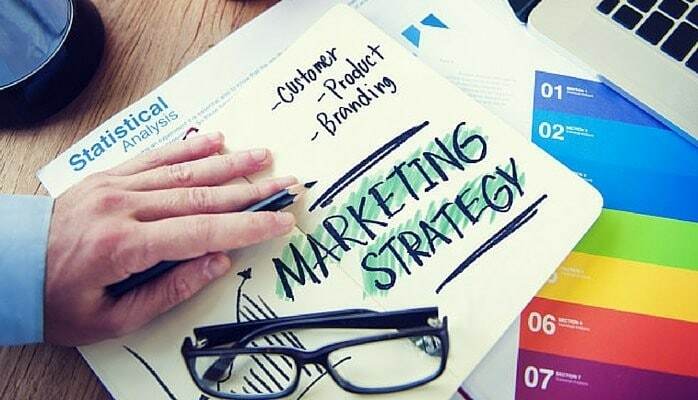 A marketing strategy also helps you to gain a better understanding of your business; what it’s selling, how it is different, who it’s selling to, who its competitors are, and more. Knowing all of this information will help you and your team to work more effectively, as they understand the needs of their customers and the conditions of the market. Essentially, a marketing strategy makes your business run more effectively, making it more successful at bringing in new customers, retaining them, and making sales. Plus, if your competitors have a marketing strategy, but you don’t, then this puts you at a serious disadvantage against them. What’s the difference between a marketing strategy and a marketing plan? A marketing plan is essentially an extension of your marketing strategy. Where the strategy outlines all of the factors affecting your business, the marketing mix you are going to implement, how you are going to communicate it, etc., the marketing plan explains how to put this strategy into action. It involves assigning more detail to the plan of execution identified in your marketing strategy, including specifics such as budget, timescales and who is in charge of what. What should your marketing strategy consist of? There are several areas you need to consider when creating a marketing strategy. One of the first things you should do is define your goals and business objectives, as these will shape the entire strategy. Next, you need to decide how you are going to achieve these goals; what marketing methods you will use, who you are going to aim your campaigns towards, how you are going to communicate with them, etc. A good marketing strategy requires a comprehensive understanding of all of the factors which affect your business, both from within it and outside of it. Firstly, thinking about the business itself, what is it that is special about your business and the products or services it offers? What is your unique selling point (USP) or unique value proposition (UVP)? Essentially, you need to think about what you do that no one else in the market does, and what value you provide to your customers. Understanding this also involves understanding your customers. If you know what your target market wants, what challenges they face, and what motivates them, then you will be able to assess what you provide them that solves their problems or meets their needs. From examining your customers’ behaviours, thoughts, etc., you will also be able to decide which marketing methods will be the most effective at reaching them, what platforms you should use to reach them, when you should communicate with them, and what language you should use to do so. As well as your business and your customers, you should also gain an understanding of the market you are operating in. Knowing who your competitors are and what they do will also benefit you when identifying your USP as you can compare what you offer to what they offer, and see what the differences are. Being aware of your market will also allow you to identify any emerging opportunities that you might be able to take advantage of, such as a new technology or a competitor going out of business. This also goes the other way, as you can also identify emerging threats, such as a new competitor in the market or a decline in your customer base. It’s important to regularly review your marketing strategy so that you can assess what aspects of it are working and which aren’t, and you can respond to any changes in the market and identify how to handle these. Remaining flexible and updating your strategy according to changing factors, both internal and external to your business, will help you to stay one step ahead of the competition. Having a strategy in place for your marketing and a plan for implementing it will help your business to achieve its goals more efficiently, meaning more customers, more sales, and more profit for you. Find out how we can help you create a marketing strategy and plan. Get in touch.